Kevin Nicholson has said that his former club Torquay United have ruled out a return for him next season. He agreed to leave fellow Conference side Kidderminster last month despite having a year remaining on his deal. "I made contact with Torquay and got the message saying there's nothing going," Nicholson told BBC Sport. 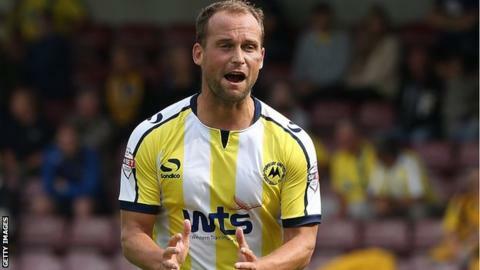 The 34-year-old played 312 games for the Devon club after joining from Forest Green in 2007 and is still based in Torquay. He was after seven years at Plainmoor. Kevin Nicholson played for Torquay from 2007 to 2014, making more than 300 appearances and scoring 13 goals. He was in the team beaten at Wembley by Ebbsfleet in the 2008 FA Trophy final, but returned the following year for the 2009 Conference play-off final, when the Gulls defeated Cambridge 2-0 to return to the Football League. "I hope that I've done enough over the past season to impress managers out there at the kind of level I want to play at," added Nicholson to BBC Radio Devon. "That desire to want a promotion, to want a cup run and to do well is stronger than it's ever been." Nicholson has recently expressed an interest in managing the Gulls in the future. His only goal for Kidderminster this season ironically came against Torquay in November. "Last summer was horrible - in the end I offered my services for free, so I played for Kidderminster for the first six weeks for nothing," said Nicholson. "When you get over 30 you often get written off - I hear a lot of managers talking about wanting young, hungry players. "But in my experience once you get to the age of 30 and above, you're hungrier than you may have been before because you know you've only got a few years left."